Almost $1 million in wages unpaid to the crew of the Indian Empress, now renamed Neom, have finally been recovered thanks to the work of legal experts from the maritime union Nautilus. The wages were accrued after the yacht was abandoned in Malta in September 2017. Following the sale of the superyacht to Sea Beauty Yachting for €35m in September 2018, the union has been working with the Maltese court to ensure the outstanding wages were paid. Individual payments will range between $1,300 to $55,000, averaging at around $20,745 per crew member. Nautilus international organiser Danny McGowan said: "We are glad that we were able to help our members in this way. It is so important that maritime professionals working onboard superyachts join Nautilus before they encounter this type of issue, as waiting until they have a problem normally means that it is too late." The long running dispute dates back to September 2017 when the unknown owner of Indian Empress is understood to have abandoned the yacht. It is alleged that more than 40 crew on board were not paid after this point. 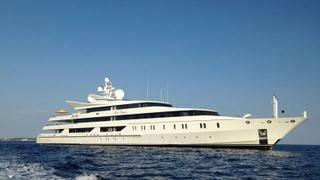 The yacht was impounded in March this year on behalf of 13 creditors who were reported to be owed around €2 million. The yacht was boarded by port officials who prevented her from leaving the port. Launched by Oceanco in 2000, Indian Empress was the subject of a major 2016 refit. She offers accommodation for up to 12 guests and 30 crewmembers in a 3,176GT interior.